How to Make Serabi Solo Indonesian Cake- Hello everybody, welcome back with ZetiraKitchen! Today I will share about How to Make Serabi Solo Indonesian Cake. Serabi is one of traditional food from Indonesia and became famous since it was made in 1923 ago. Erstwhile, Serabi was popular in javanese, so is declared a typical traditional Javanese food. Surabi shaped like pancake. But the ingredients were very different. 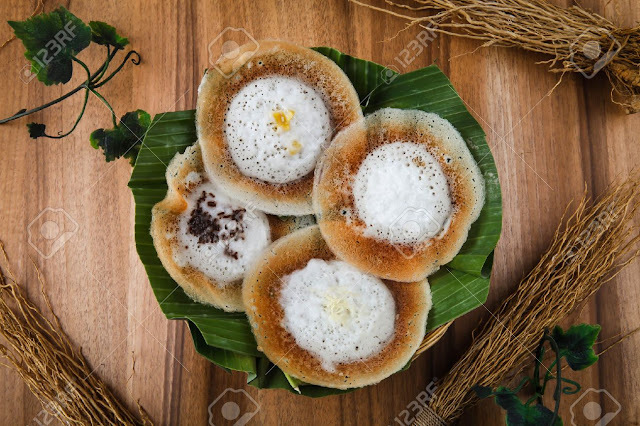 Generally, Serabi made from rice flour or flour that is burned using traditional tools, namely stoves and clay molds. In serabi solo, coconut milk is added when the making process is still processed while the serabi bandung, is usually served with javanese sugar sauce and coconut milk commonly called kinca. So right now i want to make Serabi Solo. Let's start it! First, we made the Areh. Boiled coconut milk, salt, and pandan leaves While stirring over low heat until thick set aside. Boil coconut milk and pandan leaves while stirring until boiled, measure 500 ml of coconut milk, let it warm. Mix rice flour, instant yeast, sugar, and salt Mix well, then add the egg then mix it again. Pour the coconut milk a little while kneading. Beat with a low-speed mixer 20 minutes, let stand 1 hour. Heat the serabi pan with grated coconut, stir the coconut until oily, remove the coconut oil and heat it over medium heat in 5 minutes. Pour the mixture in the Serabi skillet, press the center so that the skin is on the side, let it expand, sow with topping you want then reduce the heat. Cover and let it cook. Enjoy while warm more delicious.